The Murray River has its own mesmerising riverside gorge, comparable to Northern Territory's Katherine Gorge - Big Bend. Stop there for a moment and enjoy watching a spectacular sunset over the Murray River and Big Bend Cliffs as they change colour at sunset. The spectacular Big Bend cliffs Murray River's tallest and oldest cliffs; they've stood there for more than 20 million years. This image belongs to the travel and nature stock photo library. This stock photo of Murray River Cliffs at Twilight is available for licensing for commercial and editorial uses including websites, blogs, books, magazines, brochures and advertising. Restrictions may apply for images which contain third party copyrighted material or sensitive subjects. Photos of artwork are for editorial use only. 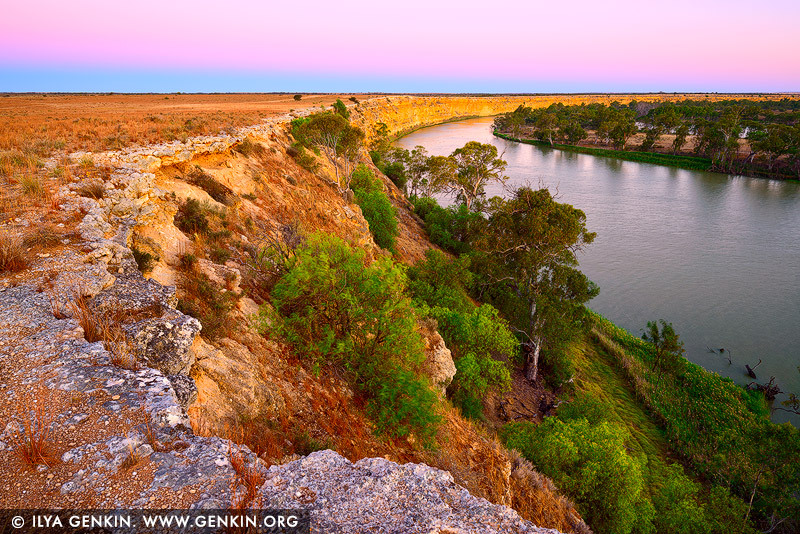 This image id AU-MURRAY-RIVER-0006 of Murray River Cliffs at Twilight, is copyrighted © by Ilya Genkin. This is not a public domain image.